The first episode of The Mary Van Note Show, which premiered July 7, includes cucumbers, lemonade, and conversational training. Filled with seemingly random plots and a dry sense of humor, this new show in IFC’s summer lineup baffles as much as it entertains. The episodes center on Mary Van Note, a girl who is in love with the mayor of San Francisco, Gavin Newsom, and will do anything to win him over. The episodes each run about three to four minutes long, and in that time viewers see Mary do everything from selling conversation for five cents to creating a restaurant in her home as a makeshift setting for dates. Seven episodes into the ten-episode series, new ones air every day on IFC.com. The show is certainly far-fetched in that its creators are not afraid to stretch the boundaries—one scene shows Mary’s roommate, Moshe, sticking a tampon in his mouth while dressed as a woman. One thing The Mary Van Note Show never fails to do, however, is to entertain. Written and directed by Mary Van Note and edited by herself and Alex Koll, the show constantly intrigues. Whether she is on a quest to find a boyfriend to make Gavin jealous or standing on the steps of City Hall with a cross-dressed Moshe, Mary makes the episodes snap by in a flash with quirky plots and one-liners. No matter how implausible the scenes seem to be, they keep you watching just to see the next outrageous or over-the-top thing the characters will do. 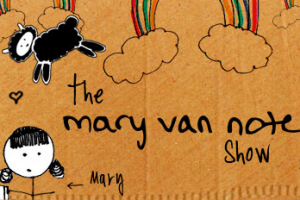 The type of show where you will either love it or hate it in the first ten seconds, The Mary Van Note Show is fearless in its execution and is a brave new foray into comedy. Sprinkled with lighthearted jabs at society as a whole (“It’s been five minutes already and no one’s responded to my ad,” Mary says after advertising for a girlfriend to go out with), the show creates laughs in its truthfulness. “Gavin really wants me,” Mary says at the start of each episode, and, as an audience, we can’t help but watch her attempts at attracting the elusive Gavin.